On the whole, I'm a great fan of simplicity; like most working adults, there are a lot of nights when I simply don't have the energy, time, or patience for a complex recipe. Other times, I'd like to go all out. This recipe, while not immensely difficult, is certainly in the "higher effort" category. I wouldn't say this recipe is complex in terms of cooking techniques. But it is time consuming - draining tofu, marinating tofu, searing tofu, cooking noodles, making sauce, sautéing vegetables - all simple in and of themselves, but not exactly what you'd call a speedy dinner option. And personally, after taking the time to test and prepare this recipe, I'd advise you take two days to prepare this dish. One day for making your sauce, draining the tofu, then leaving it to marinate overnight. The next day for cooking noodles, sautéing vegetables, searing the tofu, and combining the separately cooked elements. You can of course do it all in one go, but it's going to take a while. Personally, I think this is well worth the effort, with the result being both beautiful and tasty - but it's probably better suited to a fancy weekend dinner or even a dinner party. Unfortunately, due to the absolutely atrocious lighting in my kitchen, I don't have as many in-process photos for the recipe, so please forgive me for that. The other aspect of this recipe worth noting is that the ingredient list is long, particularly for the sauce - but try not to let this intimidate you! I worked with the staples I have in my fridge, but I'm well aware that not everyone keeps things like miso, fish sauce, or sesame oil on hand. These ingredients help create more depth of flavour, but you can omit fish sauce and sesame oil, or add a little more soy sauce in lieu of miso if you don't feel like buying a ton of specialty ingredients - the recipe should still be plenty tasty (just make sure to taste the sauce and adjust seasoning if you feel that it's lacking). 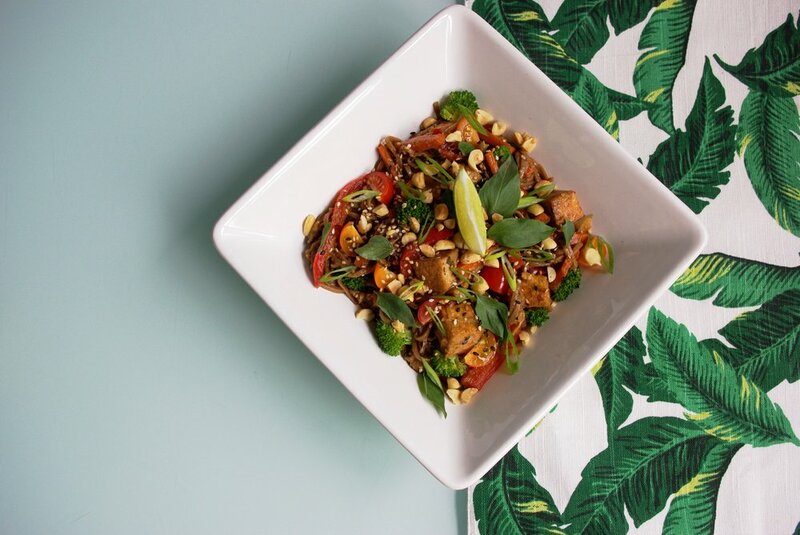 The final product should be a nice balance of salty, sweet, spicy and sour from the sauce, which pairs well with more neutral noodles and fresh summer vegetables, alongside an herbacious and nutty finish from the basil and peanuts. * If you don't have molasses, omit it along with the white sugar; use 8 Tbsp. brown sugar instead. **If you don't have rice vinegar, white vinegar is a good substitute, or use Mirin (rice wine) if you have that. *** I peel and freeze my ginger; this means I can pull it out and grate it whenever a recipe calls for it. When grating ginger, use the smallest grater you have (a zester is the best choice). If you only have a large block grater or a grater for cheese, just dice it as finely as possible - it should almost look like a paste. **** For the stir fry veggies, I just chose what I had on hand and enjoy eating. Feel free to adjust or replace any of the given veggies for something you'd prefer more. 2. PREP your sauce ingredients. Juice the limes and combine in a bowl with the sugar, molasses, soy sauce, miso, sriratcha, fish sauce, sesame oil, and rice vinegar. Grate the ginger. Dice the garlic, chilies, and shallots. Slice the scallions, reserving the green parts of the stem for another use. 3. HEAT a medium sauce pan over moderate heat. Add a splash of your vegetable or grapeseed oil and heat until the oil shimmers and coats the pan easily when swirled. 4. ADD your chilies, ginger, garlic, and scallions. Cook for 1-3 minutes, until the mixture is aromatic and shallots start to soften. 5. POUR in your liquid mixture, scraping the bottom of the pan so there's no bits of garlic or chili stuck to the bottom. Add a splash of water if desired, and turn down the heat. 6. SIMMER over low heat until the sauce has reduced and thickened slightly. 7. COOL the sauce for a few minutes. Using either a blender, food processor, or immersion blender, process the sauce mixture until smooth, working in batches if necessary. 8. CHOP your drained tofu into 1 inch cubes and place into an air-tight tupperware. 9. POUR half your sauce over the tofu, tossing to coat. Store the remaining sauce in a mason jar or another air tight container. Refrigerate the marinating tofu and sauce overnight. This is the sauce before blending. Please excuse the awful lighting, I TRIED, OKAY? 1. 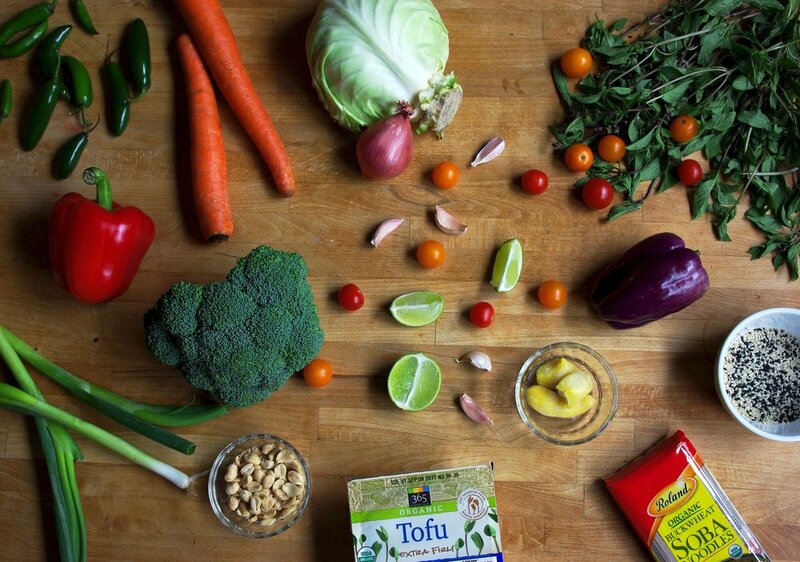 REMOVE the tofu from your marinade and blot dry on paper towels. 2. HEAT a pan (nonstick preferable) over medium-high heat. Add a splash of vegetable or grapeseed oil and swirl to coat the pan. 3. ADD the tofu cubes to the pan, turning to sear on all sides. Once tofu has been browned on all sides, add the sauce you were using for the tofu marinade, and simmer for 1-2 minutes, turning the tofu pieces so they're coated evenly. Set pan with tofu aside. 4. HEAT a large pot of water over high heat until boiling. 5. ADD two to three bunches of soba noodles (usually a pack of soba noodles with be separated into smaller bundles, each bound with a piece of paper) to the boiling water and cook as directed on the package. Strain the noodles. 6. RINSE the soba noodles under cold water until no longer hot - this will prevent them from continuing to cook after being strained. Set noodles to the side. 7. PREP your vegetables for the sauté. Cut the broccoli into small florets. Cut carrots and bell peppers into long slices, about 1/4-1/2 inch thick. Shred your cabbage into thin strands. Dice the chilies and ginger. Slice the scallions about 1/4 an inch thick. 8. PREP your garnishes. Reserve the sliced green stems from your scallion (you'll only cook with the white part of the scallion stem). Toast your sesame seeds - you can do this on the stove or in a conventional or toaster oven; if doing it over the stove, simply stir the seeds in a pan over med-low heat until golden brown; in the oven, heat to 300 degrees (f) and spread seeds over a sheet pan, baking for 3-5 minutes. Chop your toasted peanuts. Tear Thai basil leaves. Slice a lime into wedges, and cut your cherry tomatoes in half. 9. HEAT a wok or large sauté pan over medium-high heat. Add a splash of oil to coat the pan. 10. COOK the vegetables, starting with the carrots first. Cook carrots for about 2-4 minutes, until slightly softened, stirring once or twice. Next add the bell pepper and broccoli. Cook for 2 minutes more, stirring occasionally. Make a well in the center of your pan/wok and throw in the ginger, scallion, and chilis. Cook for one minute more, stirring once or twice. Finally, toss in your cabbage, but don't bother adding extra cooking time here - the cabbage will cook from residual heat as you add the sauce, noodles, and tofu. 11. POUR in half of your reserved sauce, and toss with the veggies to coat. 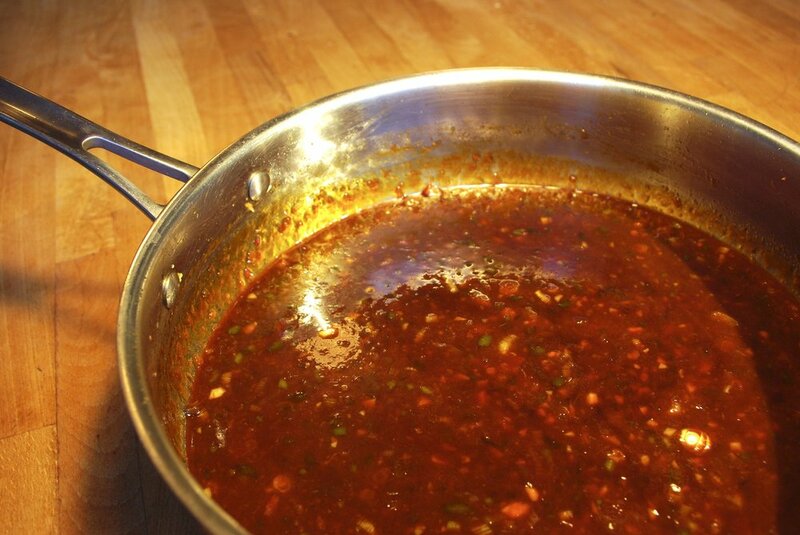 Lower the heat to medium and let the sauce simmer for about a minute to thicken slightly. 12. ADD the soba noodles to the pan, and pour in the rest of your reserved sauce. Toss the noodles and vegetables together so they're evenly coated with sauce. 13. TOSS in your tofu/sauce mixture, giving the contents of your pan one final stir to combine all elements. Turn off the heat on your stove. 14. PORTION out your stir fry/soba noodle mixture into bowls. 15. 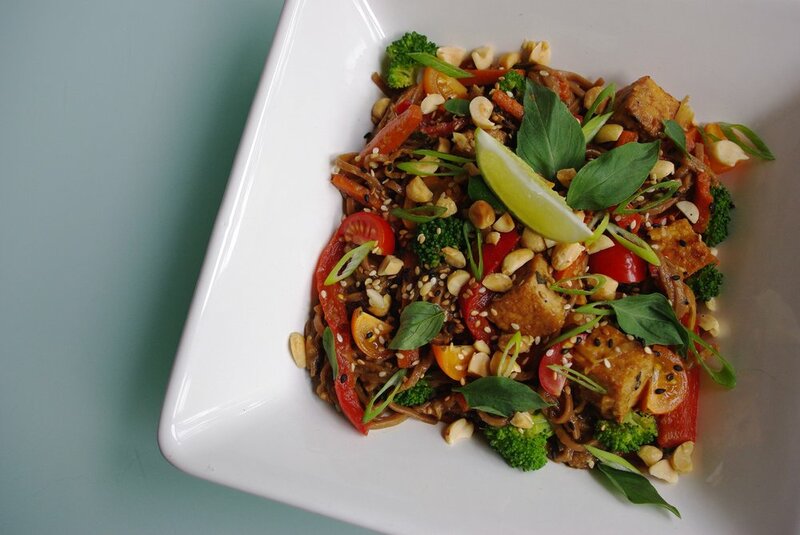 TOP your noodles with basil, tomatoes, sesame, peanuts, and scallion, finishing with a squeeze of lime juice.